Have you ever wondered where you came from or what life was like in Northern Ireland for your ancestors? A new three-part series takes one family from County Antrim to find out just that, as they embark on a journey back through time with the help of their family tree. 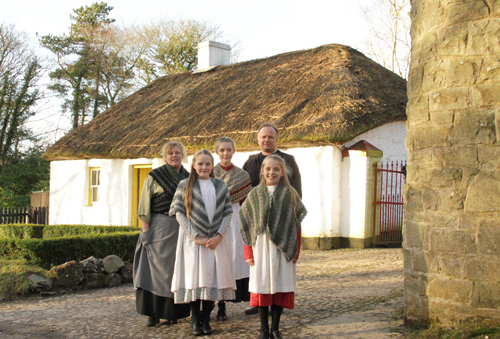 Family Footsteps, presented by Gavin Andrews, sees the Laughlin family from Islandmagee trace its roots back through the centuries and attempt to live as their ancestors once did. Family Footsteps will broadcast on BBC One Northern Ireland from Monday 1 October at 7.30pm. The series is a Waddell Media production for BBC Northern Ireland with support from Northern Ireland Screen’s Ulster-Scots Broadcast Fund. Grandfather Alan leads the charge as the genealogical detective, while mum Kerry, dad Ainsley and their three daughters Sophie, Anya and Hope surrender their gadgets, roll up their sleeves and experience the harsh reality of what life was actually like for their ancestors living here in the 18th and 19th centuries. And as they quickly discover it’s very different from their comfortable lives on the Antrim Coast. In the first episode, the Laughlin’s travel back in time to the turn of the 19th century. There they discover that their family owned a small farm near Cookstown but although they were not poor, rural life at that time meant no electricity and many manual tasks. Later in the series the family discovers their humble roots as poor farm labourers in the 1800s, even reliving their ancestoral past by spending the night in a small farm cottage with a goat. But it’s when they trace their roots further back to the 1700s that they discover a family connection with a celebrated historical figure who made big strides in America by establishing an Ulster-Scots community.